Dean Petrich, rain dripping from his yellow slicker, leaped and danced around the 50 fir poles that stick out of the ground like bristles on a hogs back. The poles will eventually support three floor levels, five hexagon living areas and a 40-foot tower -- the home Petrich has planned to build for five years. Needless to say, Dean's house is not your typical tract-home. He's traveled all over the United States for ten years, gleaning ideas from hundreds of "non-traditional" living spaces and redesigning them to fit his own particular sense of an active, involved life. Dean is a funny, funny man -- a professional clown who also teaches classes in Seattle on creativity and humor. Maybe his acute sense of the hilarious is what compelled him to have his telephone installed before the house was framed. Imagine him, in his yellow rubber rainslicker, running around the hole in the ground which will eventually be a huge subterranian bathroom; running around the hole and through the poles in the drizzling rain, to pick up a lime-green telephone and answer it as if he were in a downtown office with his feet up on the desk. He was answering a potential customer's request to buy Amway products which he has distributed since 1970. He also is a piano tuner, ski and ski-ballet instructor, studio photographer and a distributor of composting toilets. He teaches classes on self-employment, how to improve memory, new games, "why we laugh," lectures on alternative lifestyles, and gives slide shows on Arcosanti, a large self-reliant community in Arizona where he has spent his summers since 1976, learning to build. Petrich's imagination, fed by hundreds of projects he's attempted since a child, seems to know no bounds, and his house plans enlarge and expand as he talks. But the purpose of the house and the space it will provide are definite in Petrich's mind, built to suit the physical, intellectual and spiritual needs of children and adults. Take, for example, the entryway. "People coming into a house are bringing with them the emotions and the busy-ness of the outside world, so the entryway should be able to absorb that energy without disturbing those who have adjusted to the rhythm of being inside," he says. The entrance will be "the noisy room," the adult and children's playroom containing stage props, costumes, puppets, blackboards, rocking horses and anything else it collects. The center of the house will be an enormous kitchen, food storage room and greenhouse. And farthest from the activity rooms will be the quiet spaces: a "cozy room" with sunken floor levels and windowseats; music room, library and a meditation room "where no conversation or even eye-contact is required by the people using it." The house has no bedrooms, but has been designed with 33 nooks where people can sleep in privacy. 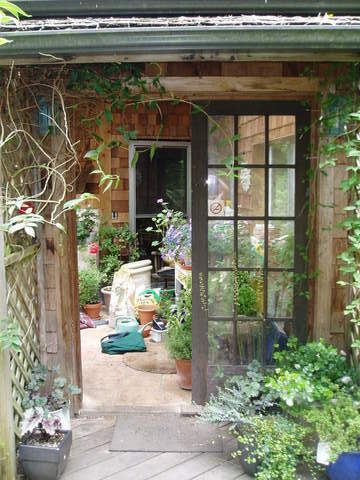 Balconies, roof gardens, porches, ferrous cement slides, wading ponds, greenhouses, studio workspaces, grottos and swimming pools are all part of the plan. In keeping with his concern for the environment, the house will be solar and wood heated, a composting toilet will fertilize gardens and greenhouse plants, and electricity may come from a solar battery or wind generator. Dean believes that Americans watch television because they're bored with their lives, and that the structures they live in hinder creativity. His house is designed primarily for children, to surround them with spaces which call for involvement, rather than passivitiy. That's part of the reason Dean is building almost completely with salvaged and recycled materials. It may take longer for the right materials to come along, but finding the stuff with which to build is a joy. Behind the forest of poles which will someday be a house, sits an intact wood stairway which someone removed from a house and gave to Dean. He has no use for it right now, but the idea of a stairway leading nowhere is hilarious to Dean -- a visual joke so fine, that his friends say they wouldn't be surprised if he left it standing in the open air.